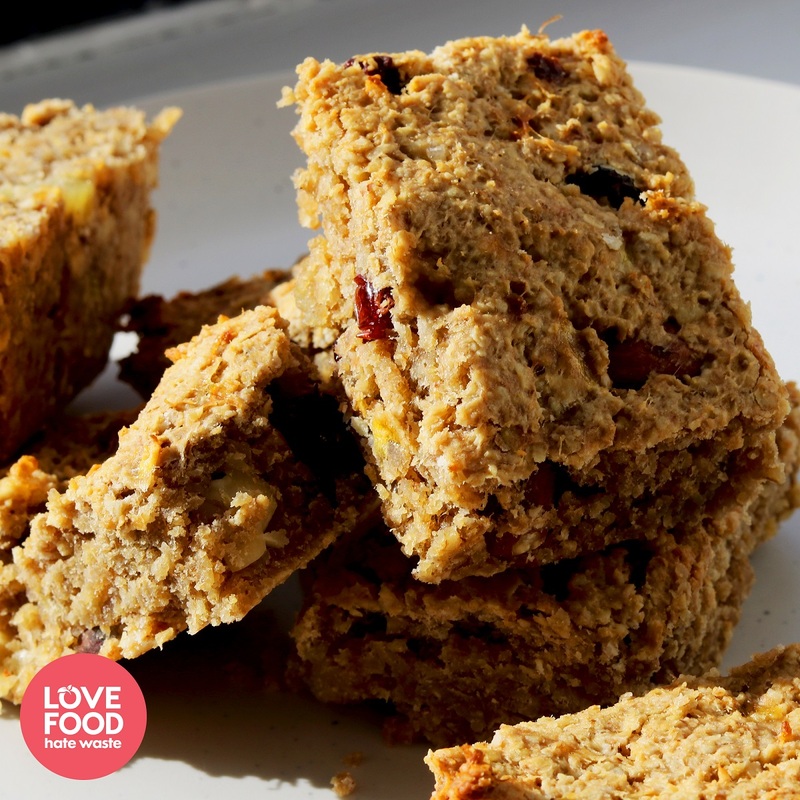 These energy bars are great for using up any nuts or dried fruit you have in the back of your cupboard; desiccated coconut, chocolate chips, or anything else you fancy! For an easy vegan alternative, swap out the butter and honey for vegetable spread and maple syrup. Preheat the oven to 180C/160C fan and line a baking tray with greaseproof paper. Melt the butter, peanut butter, honey, cinnamon and salt together in the microwave, stirring occasionally until the butter has fully melted. Mix together the oats, banana, dried fruit and nuts in a large bowl. Add the melted butter mixture and stir until well combined. Transfer the mixture to the baking tray, pressing down so it fills the corners and makes an even layer. Bake for around 30-40 minutes, until the top starts to turn golden brown. Cool slightly in the tin, then turn out onto a cooling rack and allow to cool completely. Slice into squares and enjoy with a cup of tea! Did you know that 70% of the food we throw out is binned because we didn’t use it in time? We’ve teamed up with a whole host of fabulous food waste champions doing great stuff across Scotland to bring you a brand new Love Food Hate Waste resource that’ll mean you’re never staring at your cupboards clueless again.